It’s been a day full of celebration. 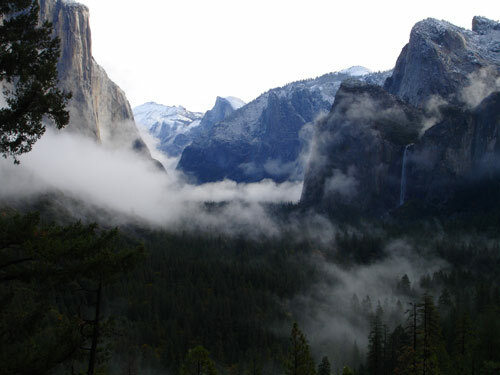 This morning Tom and I woke in Yosemite West to a fresh dusting of snow on the ground. It seems like autumn was still just winding down, and here, suddenly was winter. We trade one kind of beauty for another quickly this year. We grabbed cameras and ran outside to take pictures on the way to work. 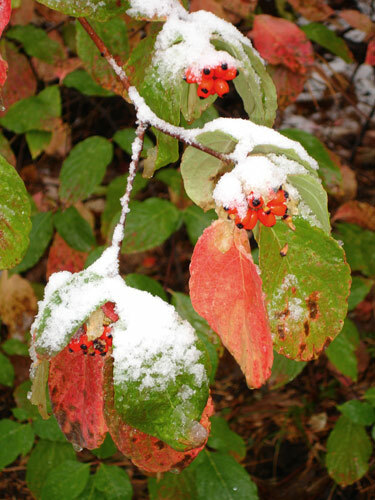 I love the snow on what is left of the brightly colored dogwood leaves. We stopped twice on the way down to the Valley to admire the view again. Nevermind that this is just “the regular commute”, sometimes it is so beautiful that it is a crime not to stop. I love the way that the clouds settle around the trees and cliffs when storms clear here. At Tunnel View, we even had a chance to brag to a guy from JPL at CalTech about where we lived. We drove to the polling place on the way to work and dropped off our ballots. A historic election, and it feels good to be looking forward to a cool-headed Dem. in the White House again. Being TV-less, we listened to the live broadcast of the campaign over the internet, and had a nice little celebration when the result was announced.